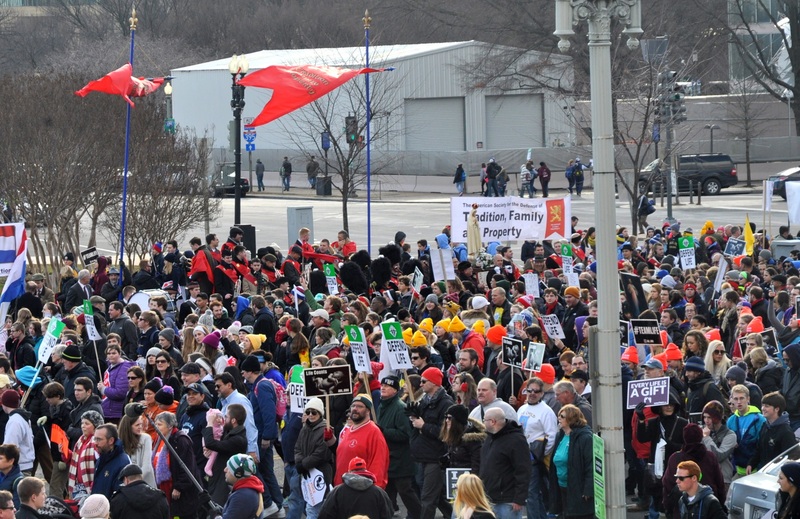 On January 22nd, hundreds of thousands of pro-life activists gathered in the National Mall for the 42nd Annual March for Life, and among this great number were those of the American Society for the Defense of Tradition, Family, and Property (TFP), and the students of St. Louis de Montfort Academy. Before the march, TFP members, supporters, and friends as well as Academy students gathered signatures for a worldwide petition to Pope Francis. 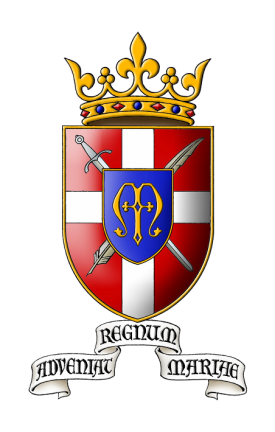 This “Filial Appeal” encourages him to continue his support for traditional marriage in the upcoming October synod. 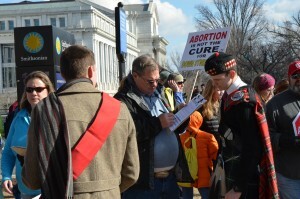 Later, the Holy Choir of Angels band with kilt-wearing bagpipers, brass, and a fife and drum corps, played invigorating songs to inspire the courageous foes of abortion on their march towards the steps of the Supreme Court. Next to the band was the blessed presence of a Pilgrim Statue of Our Lady of Fatima. Participants cheered the band as they made their way. When the leaders of the March reached the Supreme Court building, however, a group of no more than fifty “pro-aborts” tried to block the march. They were soon dismantled by the police, actually accomplishing only two things: first, holding up the march for at least thirty minutes –discouraging no one – and second and most especially, getting themselves arrested. After everyone had passed, the band and TFP entourage fell into marching formation in five perfectly straight single-file lines until reaching the Supreme Court. Once there, the most patriotic hymn of all, the National Anthem, was performed by the band, followed by the echoing cry, “Tradition, Family, Property! 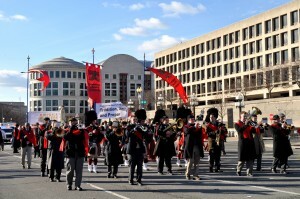 (thrice) America, America, America!” thus concluding for us the March for Life. This event was marvelous and definitely encouraged all who were present to continue to fight for the defenseless in the womb.